The Greeting Farm is bringing us the exclusive limited edition stamp/die set for Simon Says Stamp STAMPtember with Winter is Here. 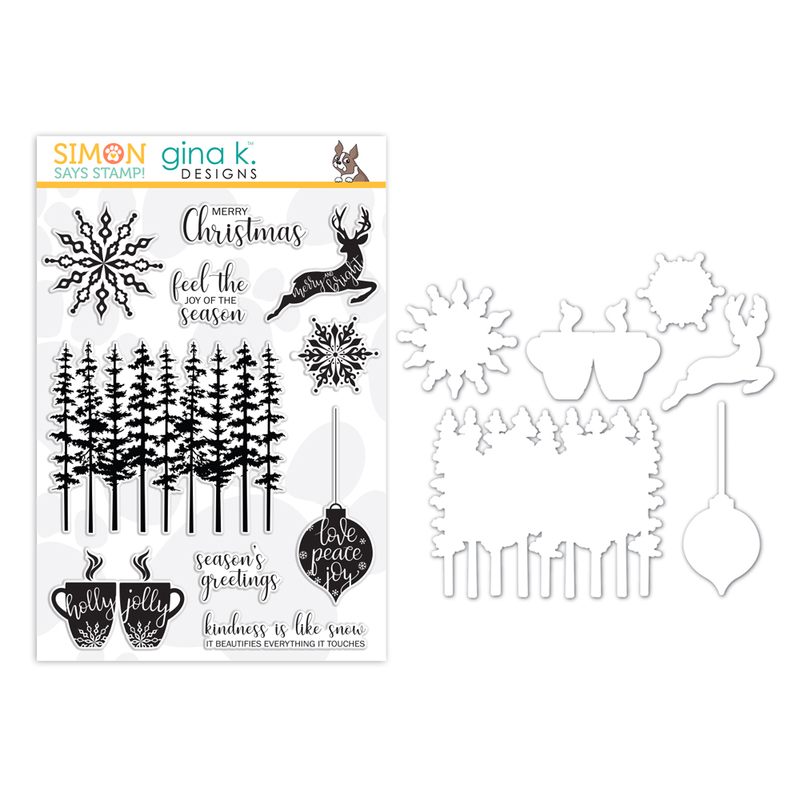 This adorable set features an adorable boy, girl, hedgehogs, a Christmas tree, snowflakes, sentiments and more! I framed up my masked scene today with a heart die cut. I love an off set die cut frame that hangs off one side of the card. Instant visual interest! A Nested Hearts Die die cut off one side of the front panel frames up this sweet little boy and girl perfectly! The boy and girl from the Simon Says Stamp STAMPtember with Winter is Here were stamped on smooth white cardstock and masked with masking paper before applying Barn Door Distress Oxide Ink to the background. Water from a Distress Sprayer was spritzed on the background and blotted dry with a paper towel. Snowflakes and the "Winter Is Here" sentiment from the Simon Says Stamp STAMPtember with Winter is Here. were stamped over the background with clear embossing ink and heat set with white embossing powder. The masks were removed and the images colored in with Copic Markers. A Nested Hearts Die was die cut off to one side of a 4 1/4" x 5 1/2" piece of smooth white cardstock and adhered over the inked, colored panel with foam adhesive squares. Another sentiment from the stamp set was stamped on black cardstock, embossed with white embossing powder, and die cut into a strip with a Sentiment Label Die. The strip was adhered with foam adhesive. The card was finished with a scattering of Honey Bee Stamp Candy Hearts in white and red. To my friends and followers, thank you for sticking with me through this crazy busy month so far! It's been a lot of projects, a lot of time, and a lot of effort but it's also been very rewarding and fun and I love sharing this crazy awesome hobby with you all! If you're new here, welcome! I'm so grateful you're joining me. Be sure to subscribe to my email list so you never miss a post, extra "newsletter only" projects and info on sales and new releases. You can subscribe HERE. You'll be the first to know about new projects, special offers, and more! The Greeting Farm has joined forces with Simon Says Stamp for STAMPtember with this adorable Pumpkin Spice It Up Stamp Set! I created a masked, stenciled and inked scene card with this fantastic new set. I stamped and masked the images from the Pumpkin Spice It Up Stamp Set on smooth white cardstock using Jet Black Ink. The Simon Says Stamp Masking Paper is nice and tacky and stays put! This was my first time using the SSS brand masking paper and I'm a believer! I was able to stencil, ink, and color over the masking paper no problem! Over the masked images I inked through the Tim Holtz Bricked Stencil to create a brick wall using Pumice Stone Distress Ink. Along the bottom edge of the scene I inked up the "sidewalk" with Hickory Smoke Distress Ink and used Copic Markers over the ink to create the detail of the sidewalk. Little tufts of grass were draw in a few places where the sidewalk meets the wall for interest. I removed the masks and colored in the images with Copic Markers. I die cut the panel with a Simon Says Stamp Wonky Rectangles Die. A greeting from the Pumpkin Spice It Up Stamp Set was stamped on the "brick wall" with Versamark Ink and heat embossed with gold embossing powder. Glossy Accents was applied to the glasses and heart and a white pen was used to add detail to the stamped and colored images.